UNFPA Turkey | University and high school students set to focus on equal rights and opportunities. Home News University and high school students set to focus on equal rights and opportunities. ‘’The Dialogue Meeting from Beijing to Present and from Present to Future’’, an event organised in a joint initiative by the Gender Equality and Women Empowerment Group of UN Turkey, the Embassy of Sweden and the Universities of Osmangazi and Anadolu on the occasion of 8 March International Women’s Day was held in the campus of Osmangazi University on 4 March 2019, with the participation of university and high school students and discussion sessions realised by the UNFPA, United Nations Population Fund, UN Women, International Labour Organisation (ILO) and United Nations Children’s Fund (UNICEF). Annika Molin Hellgren, Ambassador of Sweden in Turkey, also spoke at the opening ceremony of the event and said: ‘’Gender equality is of essential importance for society in Sweden. The primary aim of the policy of gender equality in Sweden is to ensure that every individual has equal opportunities, equal rights and equal responsibilities. Looking at the past 5 decades in Sweden, we see that there has been a close correlation between the presence of women in the labour market and improved gender equality, and sustainable growth in high rates and opportunities of access to social development for everyone. The statistics of the 1970s and the 1980s regarding the employment of women show that Sweden has experienced a transformation of great scale, whereby the employment rate of women increased from 59 per cent to 84 per cent’’. 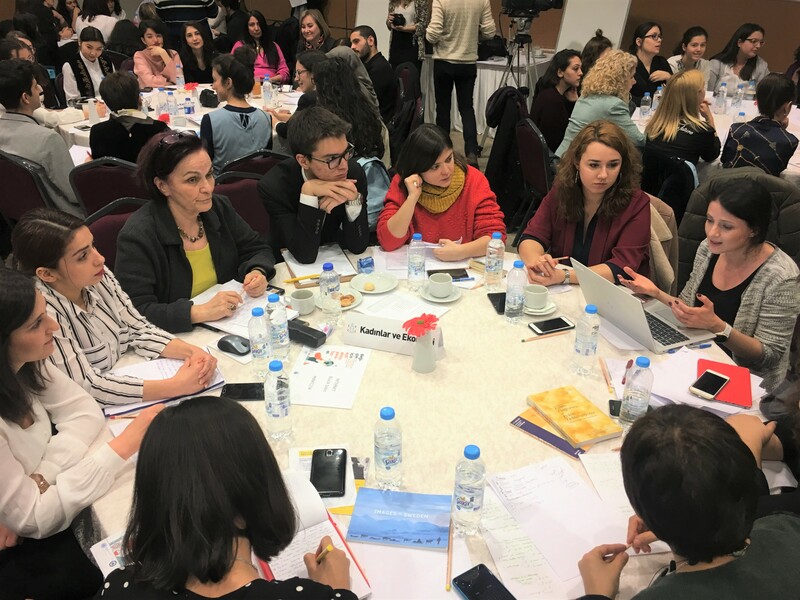 Serpil Sancar, Director of Ankara University’ Research and Application Centre for Women’s Problems (KASAUM) informed the participants about the developments in the Beijing Process and monitoring mechanisms as well as combat of women’s movement for gender equality. In the second half of ‘’The Dialogue Meeting from Beijing to Present and from Present to Future’’ held on the occasion of 8 March International Women’s Day, groups comprising university and high school students realised discussion sessions on the basis of three main problem areas they chose with moderators specialising in this subject from among twelve critical themes defined in the International Women Conference held in 1995 as strategic targets aiming at achieving gender equality. The themes chosen for discussion sessions were “Women and Health’’, “Women and Economy’’ “Violence towards Women and the Stand of Media’’, ‘’Women in Authority and Decision-making Processes’’ and ‘’Girls’’. While the session under the title “Women and Health’’ was chaired by Dr. Gökhan Yıldırımkaya, Reproductive and Sexual Health Programme Coordinator of the United Nations Population Fund, in the session “Women and Economy’’, Ms. Gül Erdost, Women Empowerment Expert in the Humanitarian Aid Programme of the United Nations Population Fund, discussed with the young people those problems relating to economic life and related solutions on the basis of the Beijing Declaration. In the session held under the title ‘’Women and Economy’’, Gül Erdost, Women Empowerment Expert in the Humanitarian Aid Programme of the United Nations Population Fund, discussed ‘’the disproportionate responsibility’’ laid on women. Dealing with the theme with focus on the double burden on working women arising from employment and burden of the household tasks, the group made special reference to the importance of mainstreaming of methods that would facilitate women’s life and ensure them gender equality. The youths participating in the discussion shared their opinion that gender equality should be integrated into curricula and taught as compulsory course from early ages. They also said that the group discussion was an awareness raising activity in respect of gender equality for them. “Women and Economy’’: “We believe that men should be included in equality projects to establish gender equality in society in a sustainable manner’’. “Women and Health’’: “We believe that age-conform structured curricula that provide young people with information on reproductive health and unhindered access of women to reproductive health services in an approach based on rights are factors of great importance to achieve equality’’. “Violence towards Women and the Stand of Media’’: “We are of the opinion that the visual representation style in today’s media presented with a masculine perspective should be amended’’. The UNFPA, United Nations Population Fund was established in 1969 and as the biggest aid source with international funding in the area of population operating around the world. UNFPA operates in more than 150 countries for creating policies and strategies that support sustainable development. Having started its activities on a project basis, UNFPA, United Nations Population Fund has been working on reproductive health, encouraging social gender equality, collecting, using and distributing data about development and humanitarian aid in Turkey since 1971. Within this framework, the first Country Program lasted from 1988 to 1992 and now the Sixth Country Program (2016-2020) is being executed.